Blackpool airport parking can be either on-airport or off-airport. For details of Blackpool airport parking options simply select from the map or the following list to view the facilities which suit your needs best. We are certain that with our price match guarantee you will find the best possible price for your Blackpool airport parking. Regular transfers operate 24 hours a day. Transfers take approximately 15 minutes depending on traffic conditions. Your car is picked up from the terminal and taken to Airparks for secure storage. You proceed straight to check in. On return, you call CPS and your car is returned to you at the terminal. CPS make additional charges for certain days and times, please click more info before proceeding with your booking. The airport offers a range of both short and long stay parking. 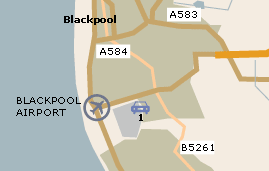 Blackpool airport has one terminal which serves 4 different airlines flying to a number of destinations. The airport provides a wide range of facilities including those for business, children and the disabled.